The Riu Palace Antillas is located on the shores of Palm Beach, on the island of Aruba. Its adults only facilities are ideal for a fantastic vacation. The hotel is the ideal place to relax, complete with a gym, a spa, and a beauty and hair salon inviting you to a wide variety of treatments. At nighttime, you can also enjoy RIU’s program of shows, dance at the club or try your luck in the casino. To maximum your stay we suggest a 4 night stay Sept 18-22, but custom stays of any dates are available with a three night minimum. A Family friendly option listed below for those of you travelling with kids. 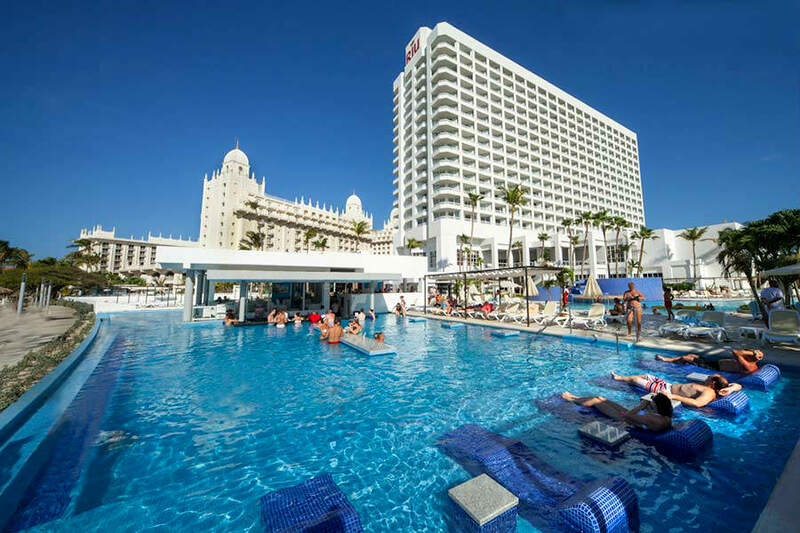 All wedding guests should stay at Riu Palace Antillas and all hotel bookings should be made through the Vacation Chic, to ensure that you will be a part of the wedding group. Travelling with kids? Please fill out the same link below and we will send you a custom quote for the adjacent Riu Palace Aruba. Riu Palace Aruba has a kids club for ages 4-12 called Riu land open 7am to 7pm that will provide child care during the wedding ceremony. Children will not be permitted at the ceremony. The above prices are for the all inclusive hotel accommodations and your shared round trip transfers. We are happy to assist you with air travel. If you need help, with airfare, please note your preferred airport when filling out the form. It is best that all reservations are made through this agency to insure your inclusion in the wedding functions. We price match, so please let us know if the price is a concern. The rooms have been blocked and the pricing is guaranteed. The deposit required for room only is $100 pp. The deposit varies for a land/air package. Please fill out one form for the entire room (not per per person) . Please register below and make the $100 pp deposit. You will need to accept or decline travel insurance. If you accept, we will send you a quote for travel insurance that you can purchase or still decline. And, please enter your security code of the credit card in the payment notes section. Please RSVP and make a deposit in the amount of $100 per person. Please note passports are required for travel to Aruba, and should be valid for 6 months past your return date of travel. See link below for more information on passport requirements.